In ancient times, Gale Crater rippled with the fresh, blue water of a large lake. Now it’s a 90-mile-wide hole in the red Martian surface. Its water is gone, but the sediments it left behind contain clues about when and where the planet might once have been hospitable to life. The Curiosity rover has been searching for those clues since 2012. Rambling around Gale Crater and inching up the 3-mile-high Mount Sharp at its center, Curiosity is studying the layers of rock that the lake laid down over time. Today, a new analysis of the rover’s findings reveals the red planet had the physical, chemical, and energetic ingredients to support life between 3.8 and 3.1 billion years ago. That’s right around the time that life got started on Earth, and it’s a larger window than scientists previously assumed. Geochemist Joel Hurowitz from Stony Brook University led a large team that scrutinized the chemical contents in 100 meters of rock layers in Gale Crater. The chemicals within the rocks indicate what sorts of conditions they formed under. It doesn’t look like much now, but Gale Crater used to be home to a large freshwater lake. A new analysis of the rocks deposited in the lake suggest that Mars was warm and wet for longer than previously thought. To reconstruct the red planet’s past climate, Hurowitz and his team measured how much aluminum each layer contained, versus minerals like sodium and calcium which easily leach out of the rock. During warm conditions, water is better at dissolving and chemically modifying rocks. So if a rock layer has a lot of aluminum but not much sodium or calcium, that indicates it formed under warm conditions. Cold water isn’t as chemically active, so a rock layer with a higher abundance of sodium and calcium suggests the layer formed under warm conditions. The rocks suggest that Mars was initially cool, and then became warm and wet. 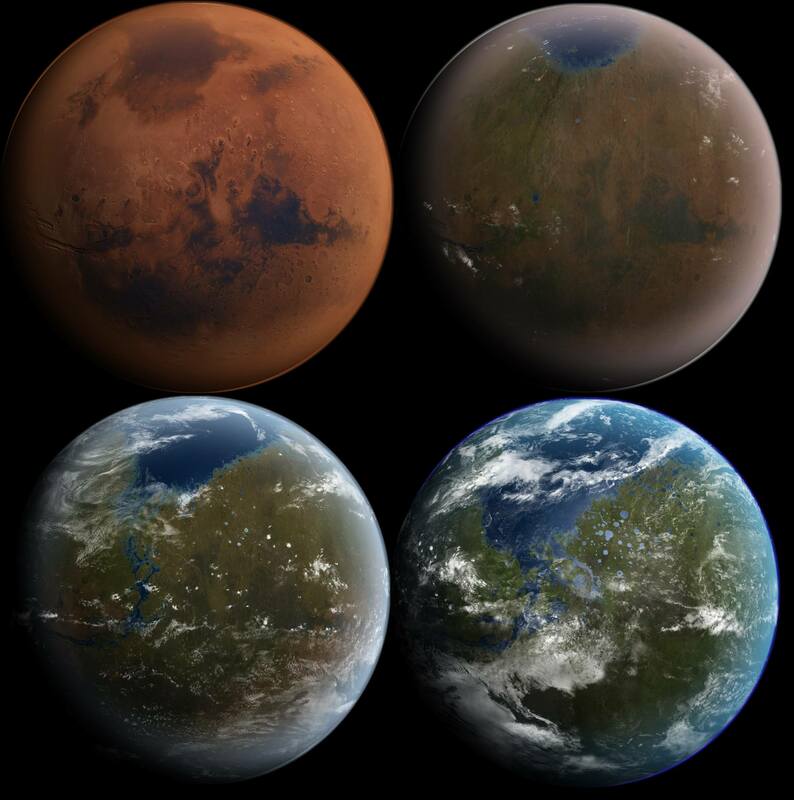 Eventually it dried out due to a cataclysmic loss of its atmosphere, but the new results indicate that Mars’ mild climate was longer-lived than scientists expected. A rendering of Gale Crater, with Mount Sharp at its center. The Curiosity rover is currently exploring this area. Plus, the upper layers of the lake were awash in oxidizing agents, while deeper layers contained reducing agents; together, these two types of molecules provide food that hypothetical Martian organisms could have used to get energy. The lake also provided a variety of ecological niches that microbes on Earth would have thrived in. There were shallow parts with lots of dissolved oxygen, deeper parts deprived of oxygen, and everything in between. “This lake presented a menu of options for microbial life, if it was present,” says Hurowitz. As to whether life ever did evolve on Mars, that’s not a question Curiosity is equipped to answer. The rover is identifying where and when Mars might have been capable of supporting life, which will help NASA’s Mars 2020 rover look for actual evidence of life on the red planet in a few years. “We’re learning a lot from Curiosity about how to go to that next level,” says Hurowitz. It’s still a mystery as to how Mars warmed up, but scientists think it may have something to do with volcanoes, impacts from outer space, or the planet’s tilt. But the extreme shift from balmy temperatures to the cold, dry desolation that Mars is today appears to have been driven by the planet’s atmosphere leaking into space. As Curiosity continues its trek up Mount Sharp, it will have the chance to study more layers of the ancient lake, and provide more clues about the planet’s history.